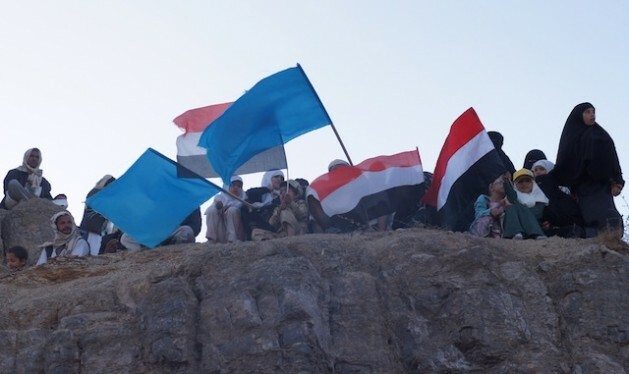 Some protesters still remain hopeful on the anniversary of the revolution in Yemen. Credit: Rebecca Murray/IPS. SANA'A, Feb 16 2013 (IPS) - This week in Sana’a thousands of Yemenis – mostly youth – crowded the highway near the landmark ‘Change Square’ to celebrate the second anniversary of the revolution. Adjacent to the university, this was the site of a tented encampment that drew tens of thousands of demonstrators throughout 2011. But in contrast to the violence between Islamists and southern separatists that marred a similar gathering in Yemen’s port city of Aden, the capital’s parade was subdued and brief. Inspired by the Tunisian and Egyptian protests, Yemen’s youth were at the forefront of the 2011 uprising. They were united by a common cause to end former president Ali Abdullah Saleh’s 33-year dictatorial rule. “In the revolution’s first few months youth felt they had the power, that they were shaping the situation, and that their voices were the most important – without the need to go to the political parties,” says youth activist Bara’a Shaiban. But two years later, many of those youth are disillusioned. Many believe their revolution was hijacked when longtime government allies, like former General Ali Mohsen al-Ahmar of the powerful First Armoured Division swapped sides in what was deemed a cynical move for self-preservation, after the definitive Juma’at al-Karama (Friday of Dignity) massacre on Mar. 18, 2011. That day an estimated 52 peaceful protestors were killed and hundreds injured at Change Square by thugs while the robust Central Security Forces, led by Saleh’s nephew, Yahya Saleh, stood idly by. Although Saleh was forced to step down in November 2011, he still resides in the heart of Sana’a, protected by an immunity deal hammered out by the U.S. and the Gulf Cooperation Council (GCC) states. Amnesty International described the deal as “a smack in the face for justice,” and angry protestors took to the streets during the brief United Nations Security Council visit last month, demanding a trial for Saleh. President Abdrabu Mansur Hadi, ushered in through a one-candidate presidential election last February, now faces the formidable challenge of rooting out the elite old guard entrenched in the government and military. Yemen’s problems are many. The security and economic outlook has deteriorated and the youth face bleak education and employment prospects, as the country remains shackled to a corrupt system based on tribal networks and nepotism. The troubled National Dialogue process has been pushed back to Mar. 18. The Gulf Cooperation Council (GCC) brokered it in an attempt to unify disparate interests – including civil rights issues, transitional justice, and the demands of northern Houthi and southerners calling for federalism or a separate state. “The problem with delays is that it pulls people further apart and we lose momentum,” says Nadia Abdulaziz Al-Sakkaf, member of the National Dialogue Preparatory Committee. Yemen’s venerable political parties dominate the National Dialogue’s 565 seats, with only 40 seats allocated to ‘independent’ youth and a 20 percent youth quota across party lines. Independent women and civil society claim another 40 seats each. Outraged by this marginalisation, Nobel Peace Prize winner and revolutionary youth leader Tawakkol Karman says she will boycott the six-month National Dialogue, and will instead work outside the conference to bring change. ‘Youth’ is defined by the National Dialogue as those between 18 to 40 years old, and make up the majority of Yemen’s mostly rural population of 24 million. But those in rural areas – with scant access to electricity, Internet and social media – have largely been left out of the process. Shaiban believes they need to nurture new advocacy methods to combat challenges in the National Dialogue. Powerful political parties and endemic corruption threaten to drown out the voices of the less experienced, and more divided, youth delegation. Illustrative of the country’s predicament are the findings of the Human Rights Watch investigation into the stalled trial process around the Juma’at al-Karama killings. More than half of 78 men indicted for the crime remain at large, and only eight are in jail. “Our research found the prosecutor’s investigations were deeply flawed and marred by political meddling,” Human Rights Watch researcher Letta Taylor tells IPS. Shatha Al-Harazi now holds television debates with youth activists nationwide to raise awareness about the National Dialogue. What she discovered was that very few activists themselves understand the process. “There is a very big gap between urban and rural areas,” Al-Harazi says. “The National Dialogue means a lot to the political elites. But it doesn’t mean much to the larger crowd because they don’t know much about it.